An e-galley was provided by Random House via NetGalley in exchange for an honest review. Summary: Theodosia was six when her country was invaded and her mother, the Queen of Flame and Fury, was murdered before her eyes. Ten years later, Theo has learned to survive under the relentless abuse of the Kaiser and his court as the ridiculed “Ash Princess.” Pretending to be empty-headed and naive when she's not enduring brutal whippings, she pushes down all other thoughts but one: Keep the Kaiser happy and he will keep you safe. 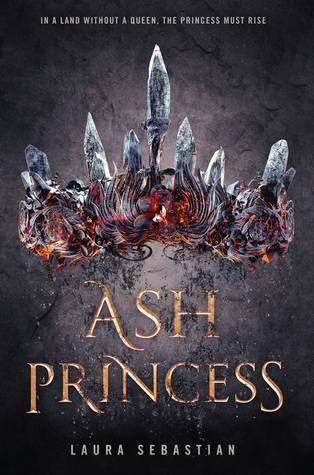 The Good, the Bad, and the Ugly: At first glance, Ash Princess could come across as a stereotypical YA fantasy. There are many overthrown princesses in YA stories and there's a lot of elemental magic. Yet, somehow, Ash Princess manages to set itself apart, even if it's just a little bit. I thought there was great character depth. I got to know Theo, Blaise, Søren, and Cress all pretty well. And characters like Elpis, Artemesia, Heron, and the Kaiserein didn't remain two-dimensional either. Listen, the Kaiserein was awesome. She's not a perfect person by any means, but I wish there'd been even more of her, because I felt like she was a very layered character that didn't get explored to her full potential. I am excited to see what we get from Cress in future books because I can tell her story is only just beginning. The world-building felt a little weak to me at times. Hopefully that'll get extra attention in books two and three, but I wanted a little more development for the various cultures. Theo's kingdom definitely felt Greek to me, and the Kalovaxians read as Germanic or even Russian to me, but that wasn't quite enough world-building for me. The magic system also felt underdeveloped, but I'm optimistic about that being explored further. There is a teeny bit of a love triangle, and I am nervous about where that will go in future books. I have my hopes for the romance, and the hopes don't involve the prince. Ash Princess has a fair amount of violence. Theo is whipped regularly, and there are deaths. The Kaiser is definitely not a nice guy. The Verdict: I enjoyed myself while reading this book. That's always a big plus for me. Will I be adding this book to my library? : I'd like to!